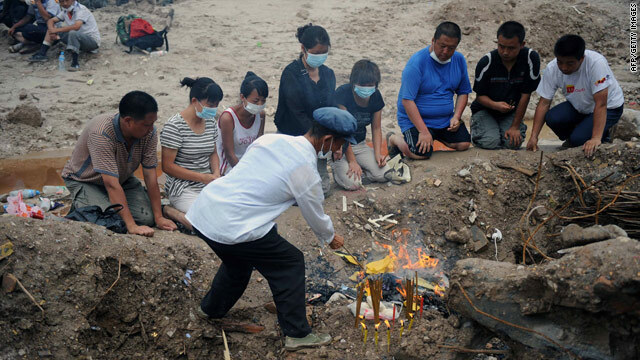 A Chinese family pay their respects to relatives killed in the landslide in Zhouqu, in China’s Gansu province on August 12, 2010. Beijing, China (CNN) — Flags will be lowered to half-staff Sunday across China and at the nation’s embassies and consulates around the world to mourn the victims of deadly mudslides in northwestern Gansu provice. The mudslides killed 1,156 people and 588 are still missing, according to state-run Xinhua news agency. 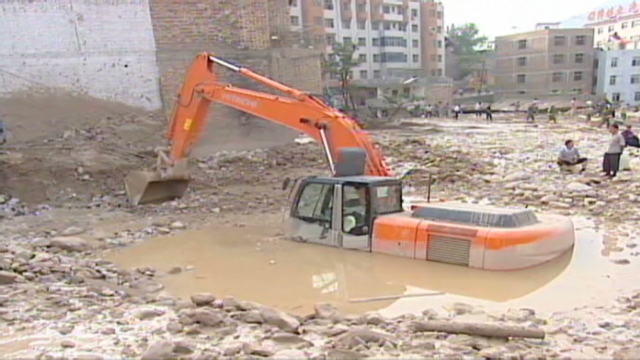 But residents of hard-hit Zhouqu County told CNN they believe the toll is much higher. Meanwhile, in southwestern China, already inundated by heavy downpours all summer, new rain-triggered landslides Saturday left at least 38 people missing, Xinhua said. Thousands of people and vehicles were stranded as roads become impassable in Sichuan province. The only highway linking Wenchuan County to Chengdu, the provincial capital of Sichuan province, was submerged under 13 feet of water. About 10,000 residents have been evacuated, Xinhua said. The county government has designated schools and office buildings of township governments as temporary shelters. The Chinese government has banned public entertainment — including movies, karaoke online videos and music — on Sunday in remembrance of those who perished in Gansu province this week. Sunday is the seventh day since the Zhouqu mudslide and, according to some Chinese traditions, the seventh day after a death is the height of the mourning period. Large-scale national displays of mourning, however, are rare in China, though it held three days of mourning after a massive 2008 earthquake in Sichuan and a one-day mourning after a quake in Yushu earlier this year. China has been drenched by heavy rains and floods since the end of May. More than 400 million people in 28 provinces, municipalities and autonomous regions have been affected.